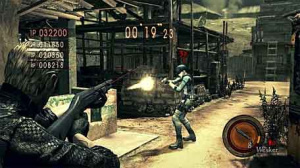 Wesker vs. Jill In An Exciting Run-Stop-Gun Deathmatch. No word on whether that applies to Europe yet, but we'll keep you in the loop as always. The pack will cost a tidy sum of $4.99 (expect £3.99 in the UK) and will add two new multiplayer modes: Slayer and Survivors. In Slayers, players will team up to go against hordes of Majini, while in Survivors it's, well, deathmatch. So expect lots of run-stop-gun excitement. We'll give you more when we've tried it out.